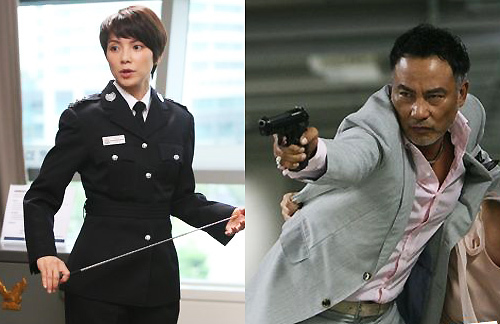 South Korean heist film, The Thieves <奪寶聯盟), which follows the escapades of 10 thieves through Hong Kong, Macau, Seoul and Busan to steal a diamond necklace, also stars Hong Kong actor Simon Yam (任達華) and Malaysian actress, Angelica Lee (李心潔) who wowed the Korean viewers despite the language barrier. The film opened in mainland Chinese theaters on January 15, 2013. The Thieves opened to critical acclaim in South Korea in July last year, and within the first week, already drew 3.35 million theatergoers. Directed by one of Korean’s most successful directors, Choi Dong Hun, the movie is currently only second to The Host at the Korean box office. The action comedy also stars Korean actors, Kim Yoon Seok, Lee Jung Jae, Kim Hye Soo and Kim Soo Hyun. With past hit movies such as Echoes of the Rainbow <歲月神偷>, Nightfall <大追捕> and Design of Death <殺生 >, The Thieves is yet another achievement under Simon Yam’s belt. Considered an “old hand” when it comes to the portrayal of a criminal, 58-year-old Simon played the role of a thief impeccably once again. He also proved his international worth when viewers in South Korea sat up and noticed this actor from Hong Kong who, among the top stars in South Korea, managed to shine through in his role as Chen. Not only can Simon do action scenes well, he still manages to steal the hearts of young girls with his love scenes, as proven in The Thieves. Playing opposite South Korean’s Kim Hae Sook, Simon has a multinational and touching love story which will have viewers reaching for their tissues. Following The Eye <見鬼> and Missing <深海寻人>, Angelica Lee will remove her mask of horror to take on the role of the daughter of a Hong Kong professional safecracker. Playing a strong and highly-skilled yegg, this is Angelica’s first foray into an action film. However, her role comes with a twist. Not only is she deft with her fingers, she is an undercover cop and viewers will get to see her in uniform. Anyway this is like paid ad. Whatever. Saw the trailer, looks like Oceans’… 11? 12? 1000? Something like that. Somehow not interested in such genre. A yegg is basically a person that breaks open a safe. What an overrated film. Seems like the Koreans will watch anything produced domestically. … Kim Soo Hyun is now a guarantee of quality. Hmm. Having good cast is 1 of the importance in making a good movie/drama. I watched The Thieves out of curiosity and it was my first Korean movie at the theatre. Yes, the main plot echoed Oceans-11 and Simon’s suave and confident self did his role justice. The suspense is ok, maybe 8 out of 10 but I like the little twists in the show. 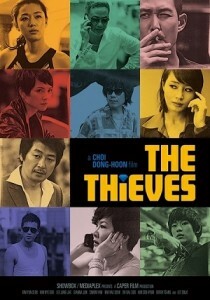 Thanks for your feedback on “The Thieves”, especially since many of us have not had a chance to watch the film yet. Did they pay you to write this? Where did you get this info from? It was a pretty good film in my opinion ….